Scrappers who work in the South Coast region of New England, which encompasses Southeastern Massachusetts and Rhode Island, are always looking for new places that will provide them with a good source of scrap aluminum for recycling. Scrappers earn cash recycling in Massachusetts, collecting a wide variety of scrap metals, including aluminum, copper, lead, steel, stainless steel, brass and iron. While some types of metals are easier to find than others, there are some metals that are worth much more than others, making them more in-demand than the rest. Aluminum is the most recycled type of scrap metal in the world. Studies have revealed that aluminum recycling is done on a global scale, helping to lower the cost of producing and manufacturing new materials for people and businesses worldwide. When collecting scrap metal you will likely come across aluminum in a variety of different types and forms. Most common is the aluminum can, which is used to provide delivery of soda pop, beer and a host of other beverages direct to consumers. Aluminum cans are often where many scrappers will start and when they make that first trip to sell scrap metal in Westport is when they realize the potential for making a profit collecting scrap metal on a much larger scale. Despite the fact that aluminum is the most commonly recycled metal on earth, it is not as common as you might think. While it is used across many different industry and is used to make many different things, you won’t find out sitting out on the curb when you make your rounds on a daily basis. It is important for successful scrappers to think outside the box and use their connections to find a consistent source of scrap aluminum that they can use to boost their weekly income. 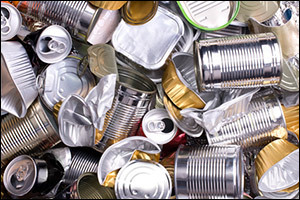 This article will provide you with tips on where scrap aluminum can be found and how you can use it to earn cash recycling in Massachusetts. Don’t think that because you are a scrapper that you need to ignore these common household items and hold off for the so-called “big stuff” instead. There’s lots of money to be made from collecting aluminum cans and aluminum foil. Believe it or not, there are ways to get access to a bunch of this stuff without having to go too far out of your way to get it. Start by making contacts within the community and let people know that you are collecting scrap metal. Make sure that your contacts know to call you when they have scrap aluminum that you can pick-up and haul away for them. It is a win-win situation in most cases, as many of your contacts won’t have time to recycle for themselves or do not participate in a municipal recycling program. In most cases, drinks are served in aluminum cans or poured out of aluminum cans and food is served in a banquet style using recyclable aluminum pans. It will take a bit to collect all of this, but it can really pay off. Just make sure you can sell scrap metal in Westport that comes from these sources and find out if there is any prep that you need to do before you bring them in to be sold. You don’t want to show up with a truck full and find out you should have crushed everything or prepared it in some way first. TIP: Rather than digging through bags, ask the facility to allow you to set up aluminum can bins at the site that you can collect afterwards and to set dirty food pans and cans out for you to take. You will need to clean them before you can earn cash recycling and it’s easier to have them separate from the rest of the trash. One of the largest source of scrap aluminum is the HVAC industry. Most homes have central air and heating and with that comes air ducts and HVAC units that need to be fixed and replaced on a regular basis. Making a connection with an HVAC company can be a great source of scrap aluminum and help you in collecting scrap metal on a weekly or monthly basis. Establish a relationship with an HVAC installation and repair company. They might want you to come out to the job site to pick up the waste materials or they may collect it on-site and want you to come when the bin is full or on a pre-set collection date. Be as accommodating as you can – remember that they are helping you to earn cash recycling in Massachusetts. HVAC companies could easily increase their profits by doing this themselves, but the really busy ones will often welcome the help of a scrapper just to take the pile of waste away. Some companies may want you to pay a percentage of your haul when you sell scrap metal in Westport. Take into consideration any break-down or prep work that you need to do, as well as your gas for picking up the materials and taking them to the recycling facility before you agree on a price. TIP: In addition to collecting scrap metal aluminum, working with an HVAC company gives you access to valuable copper wire and pipe. Speak with the company owner about collecting this type of material as well so you can earn cash recycling in Massachusetts for both aluminum and copper. Always separate materials before taking to sell scrap metal in Westport for bigger earnings. These are just two ideas to help you find a good source of scrap aluminum and bonus scrap metal opportunities in your community. The more relationships you establish with service oriented businesses, the more you will be able to earn cash recycling in Massachusetts. It is also important to get the best possible prices in the area, so make sure to call or visit Mid City Scrap Iron & Salvage. It is important to sell scrap metal in Westport at a location that is convenient to you so you can lower your overhead costs for fuel and the time spend selling and collecting scrap metal to boost your profits. Call or visit Mid City today and see why scrappers in the South Coast region have trusted this family owned and operated business for generations.